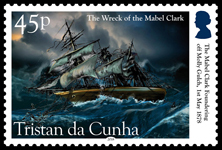 Stamps commemorating the 140th anniversary of the wreck of the US ship Mabel Clark on Tristan on 1st May 1878. Captain Oscar Sheldon was no doubt expecting a straightforward voyage as he sailed south. 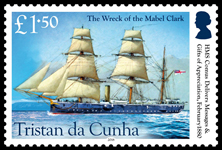 The Mabel Clark was newly built, and he had his wife and daughter with him. If so, that thought was to founder on the rocks of Tristan da Cunha. 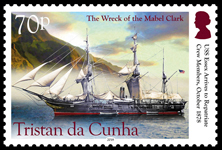 The Mabel Clark was an American ship-rigged sailing vessel built at Waldoboro, Maine, by E.O. Clark and named after his young daughter Mabel. Launched in October 1877, this was only her third voyage. She'd sailed from Liverpool on the 9th March 1878 for Hong Kong with 2,102 tons of coal. Everything went well until May 1, when at 2:00am in thick and hazy weather, the ship ran onto a rock off Molly Gulch, Tristan. The boats and everything on deck were soon washed away, and the ship began to break up. The crew took to the rigging to save themselves. The islanders spotted the wreck at daybreak and went to the beach with ropes, tea and brandy. They were seen gathering on the shore by the crew, but they realised that nothing could be done because of the high seas. The first mate, despite a badly damaged shoulder, successfully swam ashore at about 2:00pm. Captain Sheldon, the second mate and five seamen followed his example. Some, including Sheldon, were successful, helped at great risk by islanders who repeatedly swam out with ropes tied to them, and returned with seamen in their arms. Unfortunately, the second mate and another seaman were dashed on the rocks. Three more were swept from the deck and drowned. The rest of the crew remained in the rigging overnight, while islanders built fires and kept watch on the shore. Mrs. Sheldon was lashed to a mast for safety, while her little daughter Nina, was wrapped in a rubber coat and held tightly by one of the stronger men. Once, she was wrenched from his grasp for an instant, but by mere chance, her hair caught in one of the large blocks. He quickly grasped her back and managed to lash her to a mizzen top, uninjured except for two broken teeth. The storm subsided enough the next day to get out two boats to rescue everyone still on the wreck. They had been in the rigging for 37 hours, and 44 hours without food. Alas, another seaman was found dead on deck, having died from exposure in the rigging. Six had perished, but 18 survived. The following day they collected the bodies and buried them at the settlement. Tristan families sheltered the surviving castaways until they could be evacuated. The British barque Gladstone, called off Tristan on the 12th May 1878, but could not take away survivors. However, she left clothing, and carried the news to Sydney, Australia, and thence the world, arriving 22nd June. The survivors were eventually evacuated piecemeal. Firstly, the Maulesden, took two crewmen off on the 6th June to Newcastle, New South Wales, arriving 27th July. The captain had offered to take more, but sea conditions prevented embarkation. On the 17th June, the Cambrian Monarch, took Captain Sheldon and his family and seven crewmen to Singapore, calling at Anyer, Java, on the 2nd August. On arrival at Singapore on the 5th August, Sheldon deposited a formal report and a list of fatalities with the US Consul. He and the first mate sent despatches home, in which they praised the hospitality and heroism of the Tristan islanders. On the 14th August, Captain Sheldon and family, the first mate, and the ship's carpenter boarded the steam packet Gordon Castle for New York, where they arrived on the 2nd October. This left the steward and five seamen on Tristan. Ten days after the Cambrian Monarch left Tristan (i.e. 27th or 28th June) three more men got away in the iron sailing ship Berkshire to Yokohama, Japan. Then, on the 12th August 1878, the barque Hawthorn took the Mabel Clark’s steward to Cape Town, arriving 22nd August. An account of his experiences appeared in the Capetown Mail. Meanwhile, the US Navy had sent the USS Essex from Rio de Janeiro to recover the crew. She arrived on the 10th October, but found only two Mabel Clark survivors remaining there. One – Marcus Johnson – decided to marry Peter Green's granddaughter Mary Ann Green and stay on Tristan. Captain Schley performed the ceremony on the Essex before sailing away. The Essex arrived at Cape Town ten days later. The Singapore US Consul recommended that his Government reward the Tristan islanders for their gallantry, heroism and humanity in the rescue of the crew. They duly authorised him to send $25 each to five named islanders, and the thanks of the U.S. Government. Clearly, he was not well placed to send anything to Tristan, so after a rethink, new instructions were sent to London. 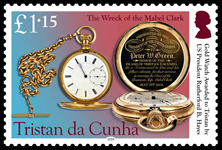 On 1st August 1879, London's American Legation sent the British Naval Station at Cape Town an inscribed gold chronometer and chain, to be awarded to Peter Green, a binocular glass, and £40 in gold to be awarded at the discretion of the next English commander to visit Tristan. In the event, this was Captain James East, who visited in HMS Comus on the 6th February 1880. He reported that the President's gifts were gratefully received. East heard how Peter Green's son William Green had been particularly heroic in risking his life during the rescue, and recommended that he be awarded a lifesaving medal. Accordingly, the Admiralty wrote to the Shipwrecked Mariners Society, who unanimously decided to award him their Silver Medal. This was delivered to Tristan by HMS Miranda on the 30th October 1880. Naturally, the islanders salvaged as much as possible from the wreck, and some of its timbers and fittings remain in island cottages today. Most visible is the Mabel Clark Guest House, named after the wreck, and featuring the ship's actual name board. The two ship's bells were recovered from the wreck. They were initially hung at either end of the settlement, but were transferred St. Mary's Church when she was built. One hangs outside the door. The other called the Anglican faithful to church for many years until the bell tower was blown down by the 2001 hurricane and had to be replaced. 45p - Artist's impression of the Mabel Clark foundering off Molly Gulch, 1st May 1878. 70p - USS Essex arrives to repatriate crew members, October 1878. £1.15 - Gold chronometer awarded to Tristan by US President Rutherford B. Hayes. The inscription reads: "Presented by the President of the United States to Peter W. Green. Senior of the island of Tristan d'Acunha as a testimonial to him and his fellow Colonists for their services in rescuing the Crew of the American Ship Mabel Clark May 1st. 1878." £1.50 - HMS Comus delivers messages & gifts of appreciation, February 1880. FDC - Birdseye view of Tristan showing the wreck site. Heading based on Mabel Clark's name board.